it&#39;s Not an Accident to Kalpana Chawla and her team..!! it's Not an Accident to Kalpana Chawla and her team..!! It should not be happen, they would have sent the rescue mission to save them. NASA people were aware of what was going to happen for Columbia. Wayne Hale , the former project leader revealed the hidden secrets about the Columbia ship disaster. Hale wrote on his blog that he was told by Jon Harpold, then Nasa's director of mission operations: "You know, there is nothing we can do about damage to the thermal protection system. If it has been damaged it's probably better not to know. I think the crew would rather not know. "Don't you think it would be better for them to have a happy successful flight and die unexpectedly during entry than to stay on orbit, knowing that there was nothing to be done, until the air ran out?" At the time, Hale stressed, Harpold's words were purely hypothetical because the space agency's engineers were working on what he called "the wrong problem". They were looking at whether the briefcase-sized piece of foam, which knocked a hole in the leading edge of the orbiter's left wing, had instead damaged the softer thermal protection tiles on the wing's underside. This was the fault that was occurred while it was entering into the orbit. And NASA made a statement that it won't affect the safety for the astronauts. A suit case sized part hit the wing part and caused the damage. 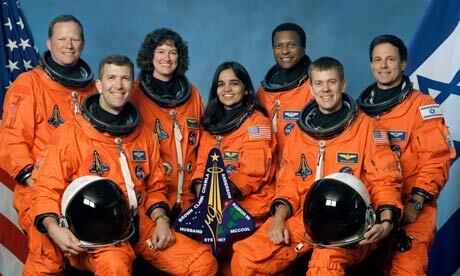 And the damage caused the death of 7 astronauts including our India -born Kalpana Chawla. After this disaster, NASA placed one rescue ship in the orbit for the next launched spaceships. They would've done this little earlier and that tragedy situation would not have been happened.